Save BIG on cheap flights with CheapOair ! Quick & Easy Comparison · Flight Search Experts · Find Lowest Prices! Find Cheap Hotels - Save Big! Get the latest discounts, promos and sales for CheapOair flight tickets at ShopBack! CheapOair is the ideal site for budget-savvy travellers to explore the globe at a discount. With the resources of its parent company, Fareportal, driving the company forward, CheapOair has access to some of the most innovative, intuitive technologies the travel industry has to offer. Fareportal combines award winning digital front-end mobile apps and websites integrated with one of the largest traditional travel agencies powered by over 2,300 trained travel agents worldwide. This model combines the best of hi-touch and hi-tech providing travellers with a next gen travel concierge experience. The company was started in 2005 and is now a globally recognised solution for affordable and budget-friendly travel. With strong knowledge and experience in the air travel booking vertical, including corporate travel management and automation of wholesale distribution of complex international airfares, today the parent company operates in North America, Europe, and Asia. In addition, they have partnered with over 450 airlines, over 1 million hotels, and hundreds of car agencies worldwide. Travellers can book flights on the site at affordable rates with several discounts deals. To book your flight, follow the steps outlined below. Step 2: You will be redirected to a page listing all available flights at the best deals. 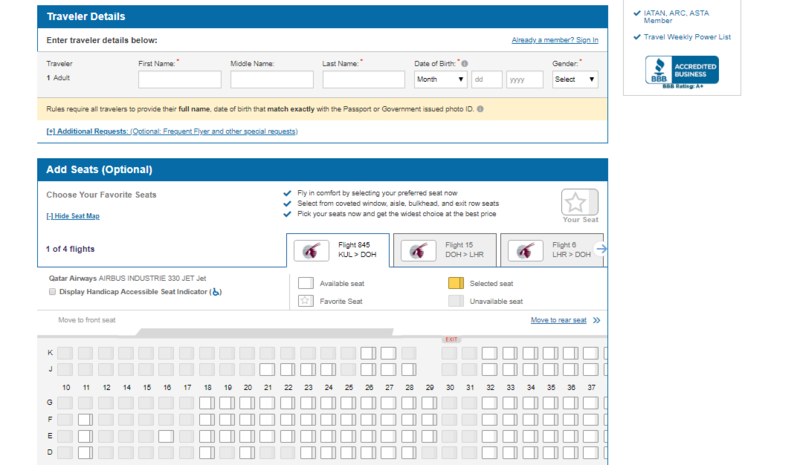 Step 3: Click on the flight or deal that you like best. Next you will be redirected to a page to book a return flight (in case of a round trip). Step 4: Review the details, enter your information and payment information. In case you have a CheapOair promo code, be sure to enter it in the box given before you book your flight. 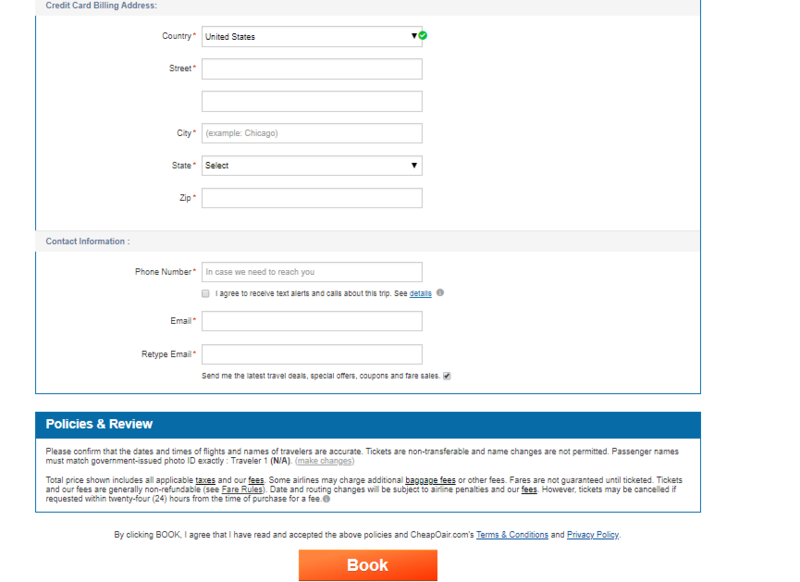 Step 5: You will receive a confirmation e-mail for your booking. To book your accommodation, simply follow the steps given below. Step 1: Click the ‘Hotels tab on the home page and enter your details such as destination, travels dates and number of travellers. Step 2: You will be redirected to a page showing you all the available properties at best prices. You can even list them by price, review score, bestsellers etc. or customise your search for properties based on location, budget, facilities and a lot more. Step 3: Click on the room you like and review the information given. Here you can find all the details regarding amenities, facilities, reviews and more. Once your booking is complete, you will get a confirmation e-mail from CheapOair for the same. To book a car, simply follow the steps given below. Step 1: Click on the ‘Cars’ tab on the main page and enter your details in the page that opens such as pickup and drop-off travel dates and locations. Step 2: You will be able to see all available car options along with important information and details. Choose the car that suits your travel or family the best. Step 3: Enter the passenger details, including a mobile phone number, email address and click on ‘Book’. 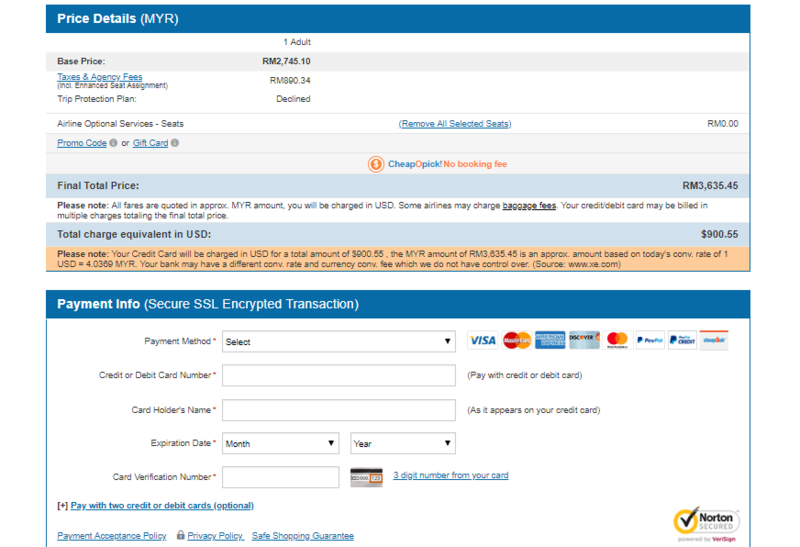 Step 4: Complete the payment to confirm your booking. Note that different car hire companies may have different requirements, so please make sure you check the car’s terms and conditions as well. In case you would like to book more than one service, you can click on the ‘Vacations’ tab on the homepage. 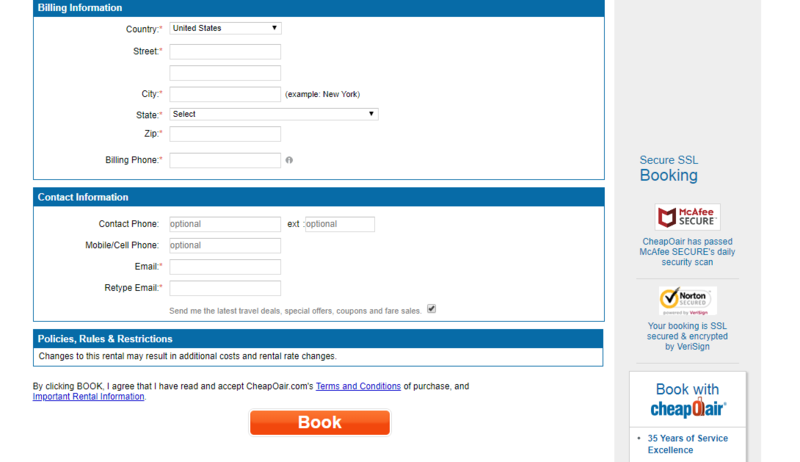 Here you can choose options for booking two services such as flights and hotel, hotel and car etc. Once your booking is confirmed with CheapOair, you can be rest assured that you’ve found a great deal. If you find the same itinerary you booked with CheapOair at a lower price on the website, or another reputable U.S. travel website, CheapOair will either cancel your current itinerary and provide you a full refund, or refund you the entire difference in price. Here’s how it works: Email the team at bpg@cheapoair.com along with the competing offer, the name of the competitor and screenshots of the flights actually available to be booked within 24-hours of receiving your CheapOair booking confirmation. To make a claim under the Best Price Guarantee, you’ll need to provide the above documentation, ensuring that, without limitation, the departure and arrival dates and locations, airline, class, fare, cancellation polity, hotel room, hotel rate and/or car class are exactly the same as your original itinerary with CheapOair. Once the company has verified this information, they will process a full refund of the difference between the lower offer and the itinerary you booked or, at their discretion, cancel the itinerary and refund you the entire amount so you can book the lower offer. Please note that partner companies may allow for different payment options. You will know all the accepted payment options available to you at the time of booking. CheapOair makes travel a lot more affordable with several promotional deals and discounts on the site. Simply click on the ‘More’ tab on the homepage to see all available deals. You can even see the most popular deals for the day on the homepage itself. Please note that the promo codes are discounts off CheapOair’s transaction service fees. On occasion the transaction service fee is less than the promo code, a lesser discount, or no discount at all, can be offered. Book Flights Up to RM 80 Cashback Save BIG on cheap flights with CheapOair! Quick & Easy Comparison Flight. Search Experts. Find Lowest Prices. Cheap Hotels Up to RM 80 Cashback Find Cheap Hotels - Save Big! Step 1: Visit the ShopBack website and click on the CheapOair link at the bottom of the homepage. You can also use the search box to find the link to the store. Step 3: Look for the latest CheapOair promo code or coupon code in the voucher codes, promo codes, discount codes and coupons section. Step 4: You will be redirected to the CheapOair website to browse and select the items. All airline tickets are 100% non-refundable. In certain cases where the airline may allow cancellations, a credit may be valid towards a future ticket purchased by the same traveller with travel on the same airline. An applicable penalty and a fare difference (if any), will be added in these cases. A cancellation fee starting from $50 per person per ticket must be paid to CheapOair at the time of cancelling the booking; CheapOair will retain this fee. The credit will be held for a limited time period, please ask the customer service agent for the specific date by when you must use this credit or you will lose the credit amount. If the airline rules allow for cancellation the day after booking, funds for the airline portion will be refunded within 7-14 business days. It will depend upon the airlines and your banking institution's policies. At times the refund will post before the charge is processed or may not appear on your current statement. Please contact your bank to verify the refund was received. Please note the cancellation and refund policy for hotels and car bookings will be determined by the policies of these partner companies. You can view these details at the time of booking. CheapOair Rewards is a free program that rewards you with points for purchasing airline tickets, hotel reservations and car rentals. CheapOair Rewards is a free program and there are no charges to sign up or to redeem your points. To start earning your rewards, you can sign up at any time. All you have to do is create an account on CheapOair.com. Earn points for flight, hotel and car rental bookings made on CheapOair.com. Double your rewards by pairing CheapOair Rewards with your favourite airline’s rewards program. To earn points on CheapOair Rewards, all you need to do is book travel as you normally would, and CheapOair will reward you for it. You’ll get 1 point for every dollar spent on flights, and 3 points for every dollar spent on hotels and cars. There is no limit to the number of CheapOair Rewards you can earn annually. As long as you keep booking, CheapOair will keep giving you rewards points. In addition, you can earn points for booking travel for others, even if you don't travel with them. Just make sure you’re signed into CheapOair.com. You will also continue to accrue points and/or miles through any loyalty program that you're currently enrolled in, in addition to earning points through CheapOair Rewards, as long as it stored in My Account or entered on the payment page under “additional details” section. Note that if you cancel your booking, you will not earn any points through CheapOair Rewards. You'll see Pending Points credited to your account after you make your booking within 24-48 hours. They will be updated to “Earned” 24-48 hours after your trip is completed. As long as you keep booking, CheapOair will keep giving you rewards CheapOair Rewards points. Otherwise points will expire after two years. you can visit the My Rewards tab in Account section on CheapOair.com to see the total number of points you've earned. You can use your points to get discount on hotel bookings on CheapOair.com automatically when you are signed in your CheapOair account. You can start redeeming rewards with as few as 200 points. Please note that CheapOair Rewards points cannot be redeemed for cash. Step 2: Combine CheapOair Rewards with any airline's rewards program and double your earnings. Step 3: Redeem and cash in on big savings on thousands of hotels across the globe. Spend your CheapOair Rewards points to save on thousands of hotels worldwide. Save big by booking a hotel stay on CheapOair after booking your flight. In case you need additional assistance you can connect with the customer care team at +1.845.848.0222 (for locations outside USA) or chat with them via the Live Chat option. In addition, you can also connect with the brand via its social media channels.